USS Prince William was named for an inlet on the Gulf of Alaska. The ship was built at Tacoma Washington and commissioned as ACV-31 in April 1943. 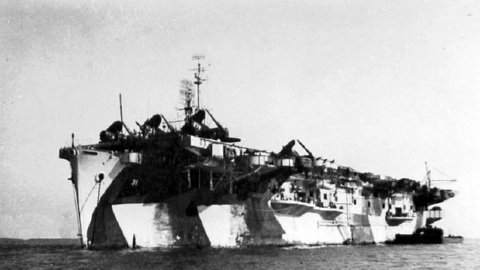 Her first duty after shakedown was to help ferry troops and aircraft to the forward areas. In July 1943, she was re-designated CVE-31. She continued operating between the US west coast and islands in the Pacific. Some of her common ports of call were Samoa, Espiritu Santo, Canton Island and New Caledonia. She continued this through spring of 1944. After returning from a trip to Australia, she was sent to the Atlantic fleet. In the Atlantic, Prince William was given a dual role. She continued ferrying cargo and troops, but only to Africa this time. But she was also given the duty of training new pilots. She alternated this until June of 1945. At that time, she went back to the Pacific Fleet via the Panama Canal. There she took up carrying troops and equipment from the west coast to Hawaii again. After the war ended, she did the opposite, carrying troops and equipment home during operation “Magic Carpet”. She was formally decommissioned in August 1946. She was struck from the Navy list in March 1959.